Today has been a busy day due to new images released from Mexico, Spain, Hawaii and the Netherlands. Traffic to streetviewfun.com has been extreme today and as a result of that our server has been down repeatedly. We are working on solving this. Ratings are turned off at the moment to reduce load on the server, but will be back as soon as things are more stable again. Apparently over 99% of our visitors come from Holland today. Anyone know if we have been mentioned in some news stories over there? 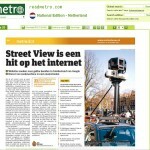 Streetviewfun.com has been mentioned in several newspapers around the world, for instance The New York Times, the big german news magazine Spiegel and the big french newspapers Le Monde and Liberation. We’ve also been on local TV in Baltimore. Yes, your site is mentioned in the national Dutch newspapers (11/11/2009) that are distributed for free on workdays to everyone travelling by train, subway and bus. Streetview was news in The Netherlands because it expanded its coverage from a measly 3 cities yesterday to 30 cities from today: a big leap. Lots of new potential funny situations waiting to be found! I red about You guys in the FREE newspaper Metro (Rotterdam Edition). They even had a top ten list with the funiest failures of Google Streetview. That’s how I found your website. Yesterday Streetview expanded their range from 3 city’s to more than 30 city’s over the Netherlands. That’s probably the reason why 99% of the visitors came from Holland. I haven’t red any other newspaper today, but I think that every newspaper has mentioned you guys. Way 2 go!